When you walk through Santa Fe, NM, you can’t help but be inspired. As you step through the streets, the culture and history jump out at you. The city is a true melting pot created by the neighboring country of Mexico as well as Spanish colonists, Native Americans, and more. You can witness it first-hand in the vibrant street markets and traditional Adobe architecture. The best way to let your creativity flow while staying at Four Kachinas is taking some Santa Fe art classes. These workshops are rooted in traditional techniques yet branch out into modern experimental forms, creating a unique blend. The alchemy of art in Santa Fe is a constantly changing mixture, so experience it yourself! If you’re planning a trip to Santa Fe, our free Vacation Guide can be a great resource! It gives you a list of recommendations on things to do in the area like Santa Fe art classes. Plus, it gives you seasonal and monthly events like catching a show at the Santa Fe Opera House so you’ll never miss anything on your trip! Planning a vacation can be hard, so let Four Kachinas make it easier. Lauren Mantecon teaches a variety of Santa Fe art classes at Mantecon Studio. Her artwork has been represented in several galleries and fellowships, including the Santa Fe Art Institute in New Mexico. Workshops delve into color theory, watercolor, large scale painting, surface design & book arts, and visual journals. People of all levels and backgrounds are invited to come to any of the classes, but if you’re looking for individual attention, you can always schedule a personalized class! Santa Fe Art Classes offers 2-hour painting courses designed for beginners. Focusing on different media and processes, these workshops range from DIY paint sessions to expanding your creative subconscious. This is truly a beginner’s art class; all you have to do is show up! Choose which night you would like to attend based on the picture you will be painting, then they will provide paint, canvases, and brushes, then teachers will lead you through the painting step by step. You can even bring a bottle of wine during their “Paint Moment” classes! Art Adventures in the Southwest is run by Jane Shoenfeld, a Pratt Institute graduate whose work has been represented on the New Mexico Highway, in NYC Soho Galleries, and more. 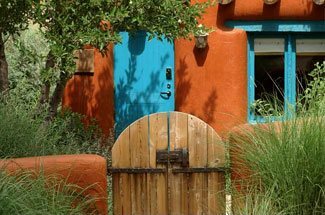 These Santa Fe art classes focus on the beauty of the Southwest Landscape, from canyon sunsets to adobe architecture. Classes include an extended Pastels at Twilight series, two-day Canyon Colors intensive, and an individual one-day Ghost Ranch intensive. Be sure to give two weeks advance notice if you are going to participate! A picture is worth a thousand words, and it is the perfect way to capture some memories of your stay in Santa Fe! If you are interested in photography, try Digital Darkroom. You can choose from a one-on-one workshop or a unique boutique photography workshop that provides creative assistance for any level of artist. The downtown location hosts small group workshops with topics such as Taos color and culture, wildlife and ranchlands in Chama, balloon fiesta photography, location light problem solving, and art, form & color of architecture. Occupying an 11,600 square-foot warehouse in the Railyard District of downtown, Santa Fe Clay includes a retail business, gallery, and studio. The space is home to 20 resident ceramic artists that provide year-round Santa Fe art classes for all levels. Let their 1,100 square-foot gallery inspire you, then sign yourself up for a class! 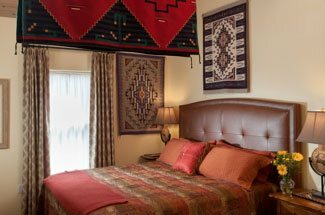 The guest rooms at Four Kachinas reflect the rich Santa Fe heritage with its Native American, Spanish Colonial, and Frontier history. With Santa Fe simply teeming with art, the decor at Four Kachinas focuses on the works of local artists and furniture craftsmen. Choose your Southwestern-inspired room to begin planning your trip, and don’t forget to schedule some Santa Fe art classes!